Japan’s chief negotiator dodged questions about any potential auto export penalties or currency clause as he emerged from the first day of long-awaited trade talks with the U.S.
Lighthizer didn’t speak with reporters. There’s a lot at stake in the talks, which will continue Tuesday, with Japan desperate to avoid tariffs or quotas on auto exports and the U.S. wanting to crack open Japan’s agricultural market and reduce its trade deficit. Motegi said the talks had been in line with a September statement between the two nations in which the U.S. emphasized reciprocal trade and reducing the trade deficit while Japan emphasized free, fair, and rules-based trade. The statement indicated Japan wouldn’t go beyond existing pacts in terms of agricultural market access for U.S. farmers while also noting that a deal would be designed to increase production and jobs in the U.S. auto industry. Motegi repeatedly deflected questions on Monday related to the possible inclusion of a currency clause in the negotiations, referring reporters to a February 2017 agreement between the two countries that said currency issues would be communicated between the Finance Ministry and the Treasury. 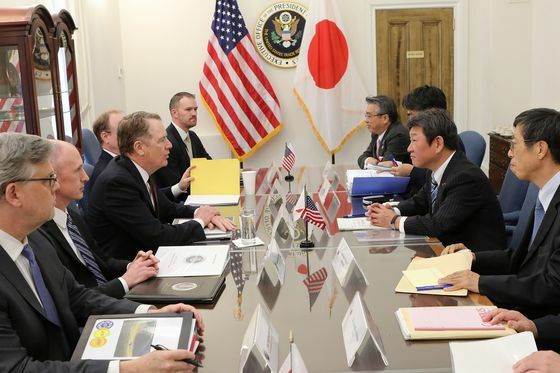 Speaking about the same time in Tokyo, Finance Minister Taro Aso told reporters that because trade talks with the U.S. were still continuing, he would refrain from commenting on remarks by Treasury Secretary Steven Mnuchin on the possible inclusion of a currency clause. Before leaving for the U.S., Motegi had said that trade talks would start by deciding on which goods categories fall under any agreement. The first day of talks largely dealt with goods, Motegi said. Japanese officials have also emphasized expectations that the U.S. will not hit Japan with auto tariffs or quotas as long as the talks continue. Last week Aso suggested the U.S. was in no hurry to reach a trade deal. Japan’s auto industry has made protests over trade threats, with Toyota Motor Corp. President Akio Toyoda saying that imported vehicles don’t pose a risk to U.S. national security, and that import restrictions would disrupt U.S. manufacturers, auto dealerships and customers. If the U.S. raised auto tariffs to 10 percent, it could shave 0.2 percent off Japanese gross domestic product growth, according to estimates from Goldman Sachs. President Donald Trump could have to come to a conclusion on actions including hiking tariffs next month, after he received a report on whether imported vehicles pose a national security threat in mid-February. He could extend the deadline for reaching that decision.